This is a classic standard tissue section staining method widely used for the inspection of tissue components for pathological analysis that’s applicable in all organs and disease models. Our scientists are well-versed in this method, based on binding of nucleic acid and other acidic components of the tissue to the basic hematoxylin stain. 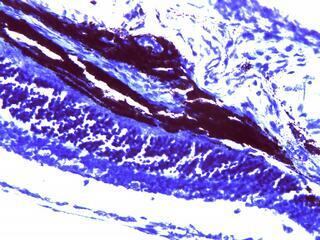 The acidic counter stain, eosin, binds to basic components in the tissue, such as cytoplasmic proteins. This method is mainly used to distinguish collagen from muscle tissue, applicable and recommended in fibrosis models, wound healing studies, infarct models and others. Periodic acid–Schiff (PAS) staining: This method is used for staining of polysaccharides such as glycogen, and mucosubstances such as glycoproteins, glycolipids and mucins in tissues e.g. colon tissues from TNBS-induced colitis model.